Good luck escorted me throughout my youth after I had the misfortune of losing my father in 1948 at the age of 8 years. As his eldest son, I inherited the friendships of which he was proud, and which I was later also proud. At their head president Camille Chamoun. His loyalty to the memory of my father has made him the closest friend of the family, even before he was elected president. I was yet never involved in politics or joined any political party. However, I was imbued by the personality, the vision and ideals of Chamoun. You were so young, how did you perceive the sympathy of Camille Chamoun? When he was elected President of the Republic, I was only 12 years old and already I was among those who had congratulated him on his victory in the presidential with Georges Hrawi brother of the current president, Shafiq Abu Haidar, father of deputy Raji Abu Haidar. These belonged to the same political side without being affiliated to any party. Our contact with the president was permanent, but our meetings were limited to visits during occasions. I accompanied my paternal uncle or Georges Hrawi, my maternal uncle, then MP and minister. Despite the affection he showed me, I could not help but be impressed by the character. Until I heard him talk about my father with very touching and comforting words that I still keep in my memory. How did Chamoun reach the highest post of the state? With his charisma, no doubt. Chamoun was already popular at school. With a law degree from St. Joseph’s University, he embarked in journalism. Later he will be elected deputy and appointed Lebanese ambassador in London. Chamoun was a pioneer of the Lebanese diplomacy. His position will help him to open up to the outside world at which he dreamed of raising his country. In December 1947, he defended the Palestinian cause in the United Nations. He represented Syria and Lebanon and was chosen for many reasons including his thorough knowledge of English. In January 48, once pronounced his speech, he collapsed, victim of a heart attack at the UN podium. Preparing files, a challenging and time-consuming work, has reduced his resistance. He will be nicknamed the «newsboy» of the Arab cause. This incident also will give him the advantage during the presidentials, with the approval of the Arabs, Americans and British, grateful for his support in their struggle to end the French mandate. THE LITTLE STORY OF MEA. In 1944, Chamoun participated in the first Civil Aviation Conference in Chicago with Fawzi Hoss as assistant. This meeting gave birth to the ICAO, organization chaired today by the Lebanese Assaad Kotait and has recently celebrated its fiftieth anniversary. Chamoun met later the Minister of the British Aviation Lord Hughs during a conference. The latter encourages them to create an aviation company in Lebanon. Convinced, Fawzi Hoss suggests to his rich friends, the Salam family to finance this airline that would later become MEA. Note that the airport already exists but the airlines that use it are foreign. MEA Lebanese limited company with capital of 1 million Lebanese pounds, a considerable sum at the time, was then born in 1945. It is registered in the Commercial Court that became Chamber of Commerce office today. It will be considered as the company with aerial activity and later in 1949 as an airline. What were the achievements of Chamoun during his tenure? His term was marked by prosperity, reconstruction and development. Chamoun was not a great talker but a man of action, cultured, art lover and music lover. It was he who founded the Festival of Baalbeck, Lebanon’s Casino, the Sports Centre, the Bank of Industrial and Agricultural Credit and Télé Liban, Canal 7 at Tallet el Khayat, Tripoli International exhibition later known as the Exhibition Rashid Karami. At Amchit, he founded Radio Lebanon, who will transmit later to the world. One of the greatest achievements of his term was certainly the right to vote granted to Lebanese women in 1953. President Chamoun declared 1954 «Marian Year» closed by the representative of the Pope Cardinal Roncalli, who later became the holy Pope John XXIII. I remember it well because I helped serve the Mass. THE PALACE OF MODERNITY. When Chamoun was elected president, he moved to the Kantari residence that Sheikh Beshara el Khoury had rented to his brother. But as it was not in the conventions that a president lives in a rented residence, he began looking for land on the most beautiful Baabda hill, and had acquired to build a presidential palace worthy of the name. He decided himself of the style and architecture inspired by Zelpha’s advice. The Presidential Palace will be unique in its design. Each room of the Palace enjoyed a superb panorama. He went further in Arab countries, and later will visit America, Spain, Brazil, Argentina, Uruguay, Greece, Turkey. At that time, the existence of the Lebanese was not recognized as such. Any traveler from the Middle East was nicknamed Turkish, referring to Turkey, which has long occupied Arab territories. The famous visit of President Chamoun to Brazil has set the record up to date. He also invited many kings and presidents to visit Lebanon. Indeed, during his tenure, the Shah of Iran, Turkish President Jalal Bayar, British Prime Minister Anthony Eden, the King of Morocco Mohammed V, men of African state … Every year at the festival of Independence, which took place at the Avenue Fouad 1, it was customary to invite an Arab personality. These include King Faisal of Iraq and King Hussein of Jordan who notably raced and won the Rally racing on the road Rabieh-Ain Aar, the only modern at the time. Dany Chamoun had also participated in the race in another category and everyone expected, wrongly, his victory because he was the son of the president. President Chamoun also organized an Arab summit in Lebanon in order to strengthen regional cohesion. The nations that joined accepted his idea to support Egypt in its nationalization of the Suez Canal. THE NIGHTS OF CAMILLE CHAMOUN. He supervised the project closely and spent long nights studying files … Minister and engineer Youssef Salem told me he was going to Kantari one night around midnight, and when he realized that the office of the President was still lit at the time, people did not stay awake, everyone dined and went to bed, intrigued, he approached the guard for information. The latter introduced him to the Palace. Salem entered the office of the president invaded by documents and plans. When Camille Chamoun saw him, imperturbable, asked him advice on the Litani project … Another president would only have considered political affairs, leaving competent experts who surrounded him the care to work detail. Among them, Ibrahim Abdel Aal and Boulos Karkache … This project took to his heart, since it will revive the Bekaa Valley. He thus achieved the Karaoun dam that will supply electricity to the south. Every town and village should benefit from this project subject to foreign pressures, which delayed it without aborting it. 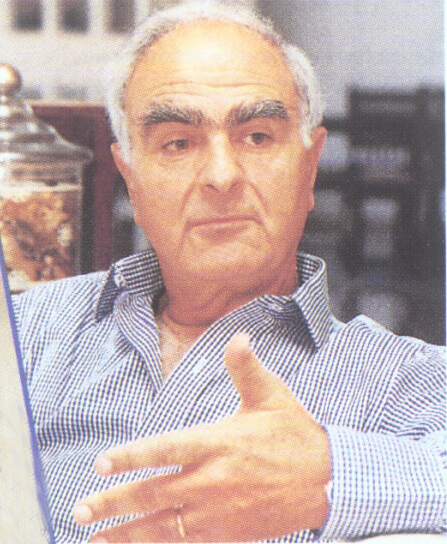 Chamoun advocated balanced development based on feasible ideas. THE MAN OF CHAMOUN. Chamoun admired Sheikh Boutros el Khoury for his judicious mind and vision. He had entrusted him with many problems that were within the industry and the economy. He was Mr. Fix-it for the president who described him in these words: «The lack of degrees and doctorates with Sheikh Boutros el Khoury is compensated by a rare inborn intelligence. I always refer to his wisdom, his leadership and his extreme loyalty. He is the man of impossible cases». Deputy under President Sheikh Bechara El Khoury, Sheikh Boutros el Khoury was soon entrusted the Bank of Industrial and Agricultural Credit, he will be the CEO. 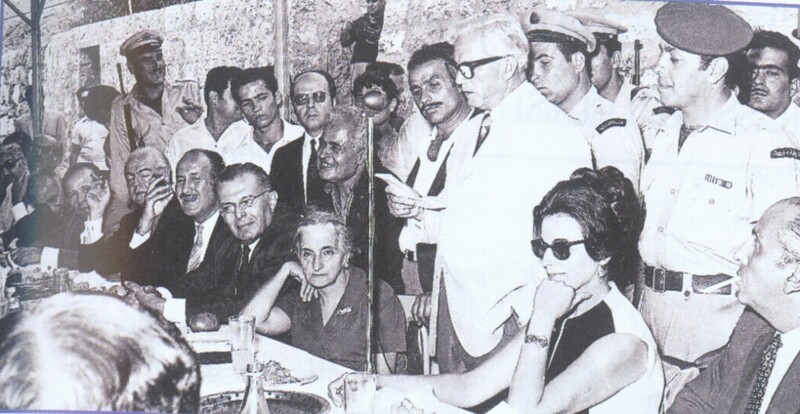 What was the role of Zelpha Chamoun and her own achievements? President instituted the festival of Baalbeck. In fact, he managed this project with his wife. She introduced Lebanese folklore in the Festival and in this regard, sent Marwan and Wadiaa Jarrar in various Lebanese villages to learn the basics of dabke then to Russia where they will create ballet based on traditional Lebanese classical choreography. We also had to pay the costumes of the dancers. Zelpha asked the President who refused for lack of funding for this purpose. However, during the same period, the curtains of the Beiteddine Palace, the summer residence of the presidential couple, had to be changed. Zelpha took the opportunity to collect the old fashioned embroidered hangings and made costumes from these fabrics. She will be assisted by her lady companion Rose Matar, ladies Laura Chafic Nassif, Najla Hamdan, Melanie Traboulsi. The first Festival of Baalbeck was held in 1957, giving birth to the professional Lebanese folklore. HONORARY PRESIDENT OF THE RED CROSS, so beset by financial difficulties, Zelpha Chamoun struggled to provide the money needed to meet this organization. To this end, she even harassed her best friends. She had always had this charisma, this magical power to rally people to her cause. She displayed all the effort, even knocked on the doors of embassies and ministries. At Baabda with the support of women, she founded the house of the Lebanese blind. At the initiative of Zelpha, the office of the silkworm was established in the year of the devaluation of apples and plums. We thought an alternative crop for rural development. AFTER THE CHAMOUN, THE KENNEDY. She accompanied the president on his travels to Argentina, Brazil, Spain, Greece, Turkey, Iran … Everywhere she was welcomed like a star under the flashes of thousands of photographers. Camille and Zelpha, a royal couple, charismatic. Later, we will compare them with the Kennedy. Zelpha was with an understated elegance that she did not have the means to pay for luxury clothing. Lady in the true sense of the term, she was passionate of nature. She loved plants and flowers and personally cultivated her garden. 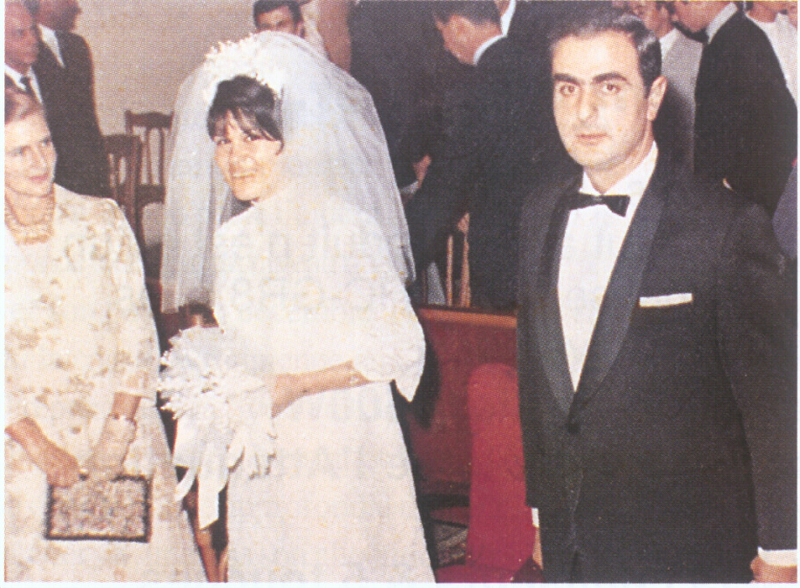 Was Zelpha Chamoun aware of the love affairs of her husband? Did they affect her a lot? She had guessed his infidelity, and then at that time we did not talk a lot of these things. Sensitive to the extreme, however, she had only one reaction, laughing and repeating «Volage!» «Frivolous!». Her pride will be preserved. No woman ever counted as much as Zelpha. For him, it was only adventures. 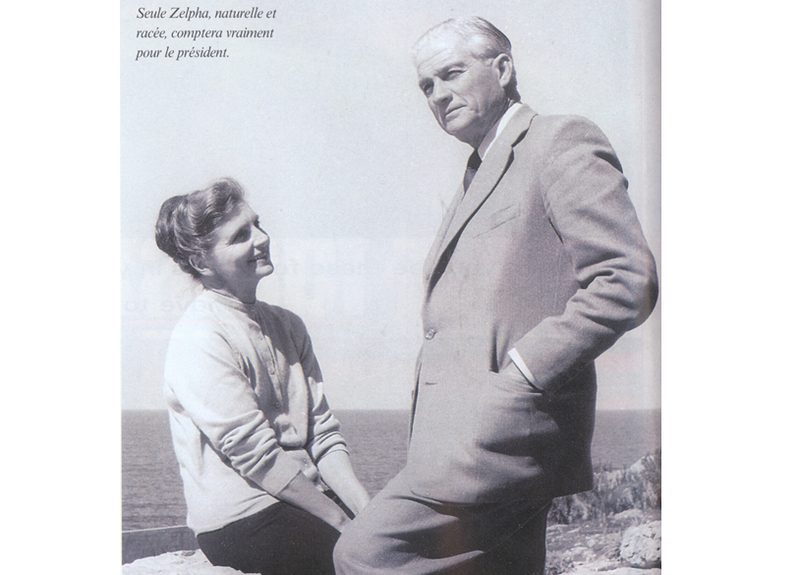 He respected Zelpha and loved her very much. Despite his reputation, Chamoun was not a womanizer. Rather a young attractive man pursued by women. Before his marriage, he was a regular at the Savoy Hotel near the Opera theater. They often organized dances and women invited him to dance. Bad dancer, he walked on their toes. The only woman he ever loved was Zelpha.Sweet and simple, naturally distinguished, feminine and strong and persevering, she always got what she wanted. President Camille Chamoun has more than once called the Palestinian cause but when it was issue of Lebanese-Palestinian confrontation, he was the patriarch of the Maronites without fanaticism and took a firm stand in order to liberate the country. His first concern in foreign policy: to preserve Lebanon’s dignity. A plane of the LIA, Lebanese aviation company owned by Arida was denied landing at Orly. Chamoun then prohibits the Air France aircraft to land on the tarmac at Beirut Airport. An incident that caused a crisis between the two countries. He retaliated after aviation reciprocity law. Faced with this attitude, the French are forced to reconsider their decision and to comply with its requirements. Did you make personal profit from his mandate? Luckily I did not need material support, the profit I pulled is purely moral. As for the Chamoun, he did not even abuse of his power to enrich themselves illegally. He kept his family and loved ones clear of power and politics. Yet he built his palace of Saadiyat. It was a simple house that does not quite answer the description of «palace». It was so called because it was inhabited by a president. This house was built after the mandate of Chamoun by the engineer-architect Assem Salam, president of the Order of Engineers at present. Note the stormy relationship between the family Chamoun and Salam in 1958. Simple architecture and furnishings, as Zelpha wanted, beautiful and simple in the amercian style. Their second home is the Deir el Qamar family residence inherited from his father. His brother Charles lived there. How would you describe your relationship with the president after 1958 when he was no longer in power? In 1958, I was 18, our relationship deepened when he retired. When he visited Ain el Abou, next to Baskinta my hometown, I formed a welcome delegation of young people. Now every 15 August, the day of the feast of the Virgin, it became a custom to offer a dinner in his honor. Event that was not approved by very young but that does not affect this custom. The funny thing is that I was penniless at the time. I was then a student. As my family owned a restaurant in Sannine, I was organizing these events. Expenses above the annual rent I was paying the amount in monthly installments. Despite the difficulties, I still managed to make ends meet. This tradition ended in 1977 because of the war. But our relationship will continue. How do you define your relationship with the First Lady? I liked her a lot and she liked me in return. At the birth of my daughter, she offered her a dress that she crafted herself. I always keep it as a dear memory. I asked her to be a witness at my wedding, she told me that I did not have the right to choose the witness for the bride. A few days later, at the insistence of my wife Salwa, she accepted and the date was fixed. The day before, I met her by chance at the airport, she was about to fly to Kashmir. I then decided to postpone the wedding date. On her return from Kashmir, she told me of their desire to come and present their congratulations. «Prepare yourself to witness next Saturday», I said to her surprise. Did this special relationship continue during your stay in London? Certainly, Zelpha prepared me pastries that she sent to the airport to send directly to London: «To Khattar». How did Chamoun react during the Safra massacre that opposed Bashir and Dany? Chamoun was not at all emotional, on the contrary, he had a lot of composure and wisdom. He knew how to absorb the shock of the massacre of Safra. He would neither blame nor revenge, his concern was to calm the bloody passion of the two young men. To seal the reconciliation, he fatherly hug Bashir, a gesture that will make the young man an ally. He was a sentimental man who never showed it. He had nerves of steel and his decisions were final. An iron fist in a velvet glove. What were his efforts to stop the hostilities? The National Accord concept advocated by all belligerents was born actually in the office of Hussein el Husseini, former Speaker of the House at the initiative of Camille Chamoun and Rashid Karamé, then Prime Minister. End of 1985 is the time of traveling decrees. Karamé boycots President Amin Gemayel and the Council of Ministers activities are thereby paralyzed. Karamé sends Chamoun, Finance Minister, a memorandum on the tax law in contradiction with a parliamentary decree, He asked his department to run in the order of the decree. Husseini urgently contacted him to «remind» him a decree requires the approval of the chamber and a prime minister is not entitled to cancel the tax decrees. Chamoun answered that it was true, but he took full responsibility for the execution of regard for the first minister. Karamé, Chamoun and Husseini meet later to settle their disputes. The dialogue was initiated. Karamé drops his memorandum. The decision was to be made public, but Karamé was assassinated on June 1, 1986. DURING THE GENEVA MEETING, in 1984, during the tenure of Amin Gemayel, President Camille Chamoun and I walked down the 10th floor of the Intercontinental, the elevator stopped at the sixth. Berri went in and I introduced him to President Chamoun. Since then, they have vowed respect and consideration. They also worked in the Cabinet of the Six. Did he have other activities than the political? He had many interests out of politics. He loved literature and poetry, he wrote one hour every night before bed. He also read and himself drove his car twice a week until his death. Passionate of hunting, he had a large gun collection. Where is now this collection? It was first entrusted to his son Dany. As the battles raged, the British ambassador asked him, what more logical than to take refuge in the premises of the embassy? Dany refused and did not listen to the advice of his wife and children terrorized. Rather he entrusted the collection of guns to the ambassador of fear of being stolen. Everyone knows the result, the collection was saved, Dany and his family were murdered. «No more time for mischief», The next day, his heart stopped beating at 5:15. Dany and I were at his side. We kissed his hand in a last farewell. MY PRESENCE AT HIS SIDE gave me great confidence in myself. After his death, Habib Abu Sakr, General Manager of Finance revealed to me that Camille Chamoun had charge of regulating and facilitating the affairs of Hadati if they were to get into trouble with the authorities.